Tuesday night from 6-8SLT a group of students in my class will be hosting thier final project; Second Life Idol at the Music Academy Online in SL. They have 8 contestants, all Real Life singers who perform in Second Life lined up and ready to go. The event will be three rounds with audience voting to determine the winners. a 5000L prizer and an iTunes gift card will be given to the winner. During the event donations will be taken for the Relay for Life. Last Thursday the event was featured on the Music Academy Live weekly broadcast on SLCN.TV. A clip of the show is below. Tonight April 27, 2008 the first group of my students will be hosting their final project in Second Life. 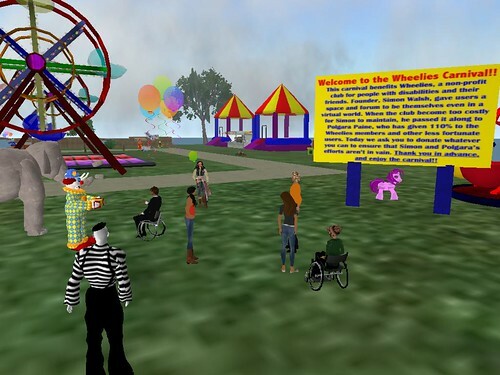 The group is having a carnival complete with rides, games, clowns, and DJ to raise money for Wheelies (see the movie below) starting at 6SLT. Some of the students in my Working in Virtual Worlds class recently submitted an extra credit assignment where they had to pick a virtual world and make a short video providing an introduction for a noob audience. These are the first few i have received. This extra credit assignment turned out pretty well so i think next semester i will incorporate it into the regular content of the class. Each student will have to create a machinima about their final project so this exercise gave them a little practice before the major movie is due.